It’s been just over two months since the UK decided to take back control and, as the summer parliament recess comes to an end, IPcopy thought it would be a good time to take stock of where things stand. 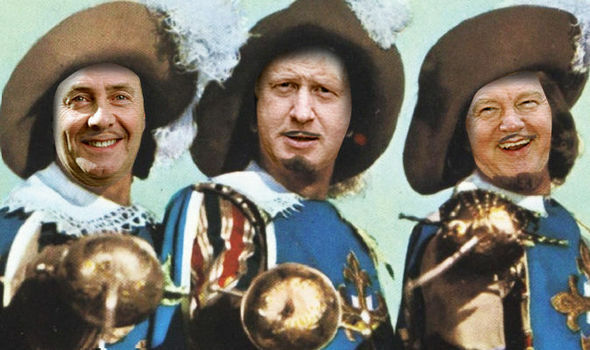 The process of Brexit has been split between three Ministers – the Three Brexiteers of Johnson, Fox and Davis – which has already resulted in some turf wars. David Davis, heading up the Department for Exiting the European Union, has raised some eyebrows by claiming that the UK could do one-to-one trade deals with individual member states of the EU (it can’t) and that he wants to negotiate a trading area 10 times the size of the EU which sounds impressive until you realise that that would actually be 1.5 times bigger than the economy of the entire planet Earth1. The UK has a serious shortage of trade negotiators which led Nigel Farage, seemingly without even a hint of self-awareness, to suggest that the UK looks abroad for its trade negotiators and one set of meaningless soundbites (“Take back control”) has been replaced by another (“Brexit means Brexit”2, “Britain is open for business”). Of course until the UK actually leaves the EU nothing changes. As far as the IP world is concerned it’s very much a case of continuing “as you were”. Any changes that may impact the Community design and EU trade mark areas are, thanks to the mechanism of Article 50, at least two years away from the point the article is invoked and the current patent system will be unaffected by any changes (though there are question marks over what may happen to the unitary patent and Unified Patent Court and there may be some adjustments to the SPC regime). In the week following the referendum the trigger date slipped immediately to autumn 2016 as David Cameron said it would be a decision for the new PM to take (at that point of course the leadership election was expected to drag on until September). In July 2016 we were told that the Article 50 notification would not be before the end of 2016 and the Conservative chairman even suggested that it might not be triggered until 2020! During August we’ve heard that the trigger could be delayed until autumn 2017 because the French and German elections would get in the way if the notification is made before April next year. And more recently we’ve heard suggestions that it may be after 2017. The upshot of all the above is that no-one really knows when the process will truly get going. Not much has changed it would seem since 23 June 2016 though Nigel Farage revamped his look to sport a moustache (Warning – you can’t unsee this image!). It’s noted that Farage’s Moustache quickly attracted 6 twitter feeds so it’s nice to see that the whole business of Brexit has left a legacy of improved political debate… The fact that he shaved it off for his recent appearance at a Trump rally will no doubt be a further talking point. Given this uncertainty, if you are an IP rights holder/filer, what should you be thinking about now? Recent/future trade mark and design filings – for new trade marks and designs, consider filing applications now in the UK along with EU applications. For EU trade marks and designs filed within the last six months, consider filing new UK applications claiming priority from the EU applications. There will be options down the line to convert any EU trade marks and designs into UK rights, but the processes are not yet settled and there will be costs and administration associated with the conversion process that can be avoided by filing UK rights immediately. Plan and budget for converting trade mark and design filings – whatever the process for converting EU trade mark and design rights into UK rights, there will most likely be options to apply for the conversion process before the actual exit of the UK from the EU, so as to ensure there is no break in protection. For older registrations, it is worth considering sooner rather than later which EU registrations should be converted into UK registrations when the time comes. It will also be important to budget for this conversion process, and longer term to budget for additional renewals of UK rights. Agreements – for future IP agreements, when setting out territorial scope the UK will now need to be specified separately from the EU. Where agreements previously might have stated ‘Europe’, care should be taken to clarify whether this means only the EU, or whether the UK and other territories are to be included in the territorial scope. 3Thanks to Tufty for pointing out this correction. By ipcopymark in Designs, General Interest, Patents, Trade Marks on August 25, 2016 . Article 50 is in the Treaty on European Union, which was last amended by the Lisbon Treaty (OJ EU C 306/1, 17 December 2007). The Lisbon Treaty was an amending treaty, and inserted the provision by means of Article 1, paragraph 58, which numbered it as a new Article 49A. It has since been renumbered as Article 50. For a consolidated version of the TEU, see OJ EU C 326 26 October 2012. All very confusing, as EU law tends to be, but you really should at least try to get your facts right. Thanks for the heads up there Tufty. Funnily enough that part of the article was the one thing I’d left to double check before posting but I misread one of the linked articles in my haste to post. Proof that this Remainer is only human. Thanks for correcting. I will choose to ignore the other stuff.